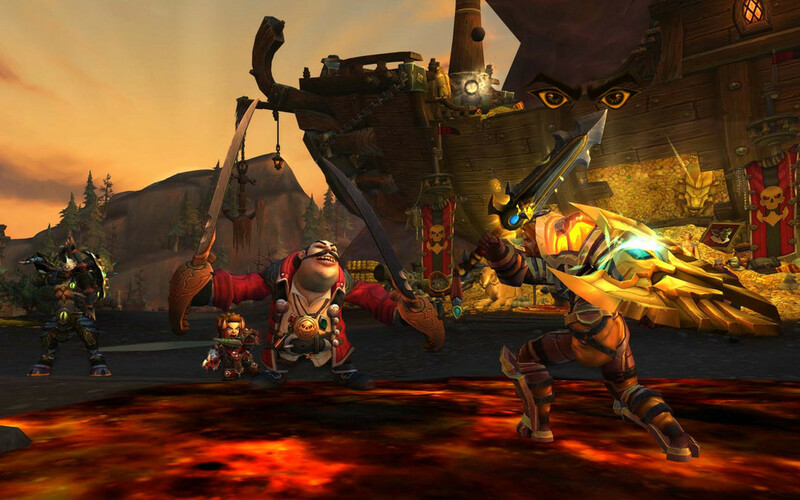 Baz heads to LA to go hands-on with WoW's upcoming expansion. Battle for Azeroth, World of Warcraft’s seventh expansion, is launching on August 14. At a press event at Blizzard’s Los Angeles campus this week, the WoW team detailed some of the expansion’s key features. 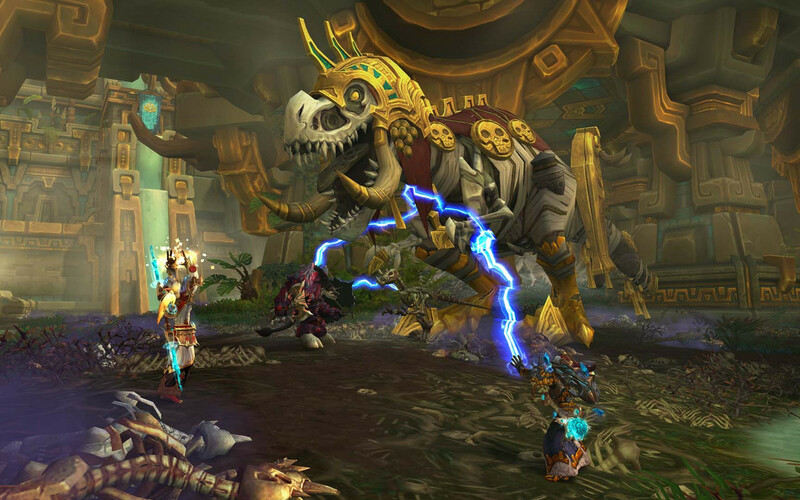 World of Warcraft game director Ion Hazzikostas discussed the WoW team’s approach to storytelling over the past five years, and how it has worked to build a narrative that develops from expansion to expansion. “Through Wrath of the Lich King there was no real connection, they were completely independent games,” Hazzikostas said. “Since then, we have tried to weave a consistent narrative that ties all of our expansions together – whether it was Garrosh’s fall and escape to Draenor at the end of Mists of Pandaria giving rise to Warlords, then Gul’dan’s emergence from the dark portal at the end of Warlords giving rise to Legion. The expansion opens with the Alliance attacking the Undercity. This is the spark which ignites the full-blown war this expansion will focus on. Because these two faction reside on separate islands, both the Alliance and Horde will be searching for naval powers to ally with in order to invade their enemy. This brings players to the islands of Zandalar (Horde) and Kul Tiras (Alliance). There, all work to enlist allies, including old favourite characters such as Jana Proudmore and new characters like powerful troll Princess Tanlanji. 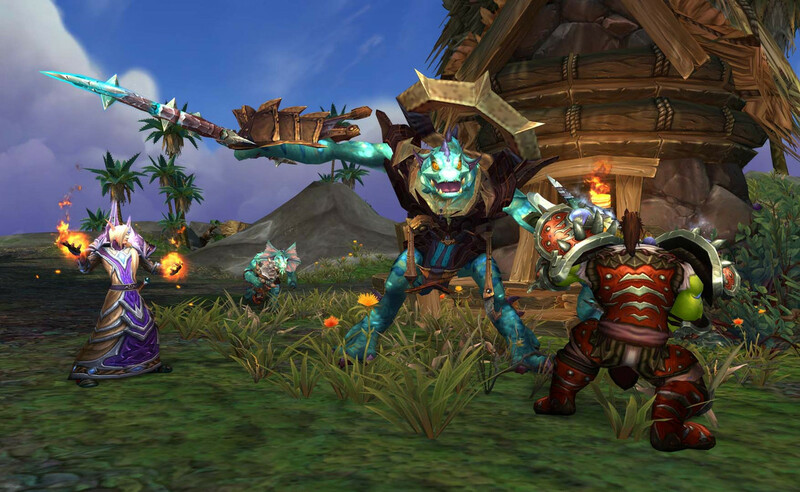 Hazzikostas also outlined a new PvP system coming with the expansion, called War Mode. This system allows players to opt in or out of open world PvP encounters. Players questing with PvP mode turned on will receive more XP, as well as additional gold and rewards from some quests. “Rewards need to make up for the inherent inefficiency of PvP combat,” Hazzikostas said. This system is great news for Oceanic players, as it will nullify the need for players to choose between a PvP or PvE server type. Hazzikostas said Blizzards has been working towards making it easier to roll low population servers together, and that this step removes one of the larger hurdles for doing so. Oceania has many low population servers, so this consolidation could lead to better populated realms. Hazzikostas also elaborated on the two biggest new systems being introduced in Battle for Azeroth: Warfronts and Island Expeditions. The Warfront mode tasks players with building war resources for the assault of a base. Hazzikostas said that the first of these bases is Stromgarde Keep in the Arathi Highlands, which indicates that there will be additional warfronts in the future. Each faction donates resources such as materials, gold and Azerite to build up their war front. Once a faction reaches the threshold, all members of the faction in that region will be able to engage in a 20-player co-operative skirmish battle. Hazzikostas said these skirmishes have been heavily inspired by Warcraft’s RTS roots, putting players in the role of a commander who is tasked with landing on the battlefield, building up your base and troops, and assaulting and capturing the enemy base. “This description is two thirds of a Warcraft RTS mission. That was our inspiration for Warfront,” Hazzikostas said. As well as inspiring the team mechanically, this mode also pays homage to the aesthetics of the Warcraft RTS games, with buildings such as the War Mill and Armoury being recognisable in the game mode. These skirmishes will result in the attacking faction gaining possession of Arathi for a period of time – Hazzikostas said that this will likely be around 5-7 days. While your faction holds Arathi, you will be able to explore the region and complete quests there. Hazzikostas also said there will be effects on the wider world depending on who currently holds the Warfront base. The second major feature of Battle for Azeroth is the Island Expedition mode. In this game type, you and two other players are tasked with mining 6000 Azerite from an island before an opposing team meet that same threshold. To collect Azerite, you race across the island looking for Azerite nodes to mine, mobs to kill, and enemy team members to battle. 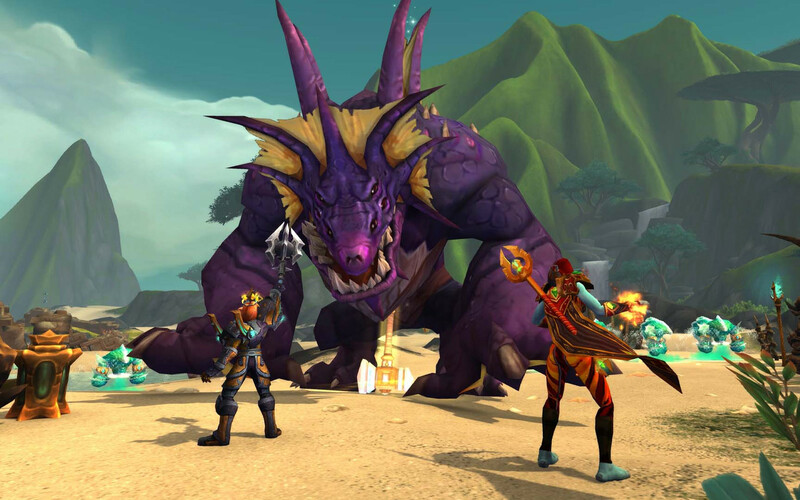 Hazzikostas said there are currently six distinct islands in this game mode, but dozens of different enemy types and features which will randomly spawn on different parts of the islands. So, each time you play, the island will present differently. However, although there will be some variety, the development team also wanted players to be able to somewhat familiarise themselves with the islands, so there will be certain events and enemies which players will become accustomed to. For instance, on playing this mode we encountered portals which would spawn partway through a match. These portals led to boss enemies, of which players will become familiar and be able to more effectively approach through practise. Although this game mode can be played in PvP, the primary mode actually pits you against a team of enemy AI. The WoW team has developed these AI from scratch for the purpose of this game mode, and they are far more advanced than any NPC that has previously existed in the game. As well as being a challenge in combat, these AI also have varied tactical approaches to collecting Azerite. Their tactics may shift depending on how you are approaching the island. However, they also have base tactics which will make some play more defensively, and others aggressively. From my hands-on experience with this mode, I found that these AI enemies are indeed difficult – in fact, currently the entire mode is very difficult. Of the four matches we played on normal, we lost all four. However, we did improve our score each time, and were constantly discovering new and more effective tactics. Also, speaking with the developers, they said that the week before we played, the mode had been made considerably more difficult, and that they expect by launch the difficulty will be much better balanced: normal mode will be easier, and higher difficulty tiers more challenging. ◆ Baz visited Blizzard Los Angeles courtesy of Blizzard.